NASA’s Voyager spacecraft are hurtling towards the edge of our solar system, more than 10 billion miles away from our sun. Interstellar space – the medium between stars – is a region no human-made craft has ever been. On Apr. 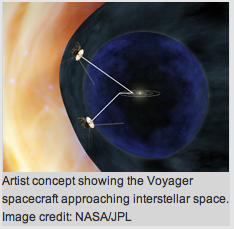 28, 2011, a live NASA TV program will feature mission scientists discussing the distant areas Voyager 1 and 2 are exploring, 10 billion miles away from our sun. NASA is inviting classrooms to submit their single best question about the Voyager mission and interstellar space to the science panel. We are also inviting students to submit their best idea about what they would put on a new Golden Record, if one were ever created. Teachers interested in submitting a classroom question should email jplspaceeducation@gmail.com as soon as possible to hold a spot in our random drawing. Please put “Voyager Question” in the subject line. Due to resources, only the first 20 educators who express interest will have their class’ question and answer posted on the Voyager website. Approximately 5 of these 20 questions will be randomly selected and submitted to our Voyager science panel during the live NASA TV program. (Note: teachers do not need to send the question immediately; they need only send an e-mail stating their interest in submitting a question.) The first 20 respondents will be given a deadline for question submission. Teachers should send their students’ best idea for the Golden Record by Apr. 21, 2011, to jplspaceeducation@gmail.com. Put Golden Record in the subject line. Ideas will be posted in a timely manner on the Voyager website.nclude school name, city and state along with the Golden Record idea. State if you would like teacher name and grade level included when we post the idea.